San Francisco, CA — San Francisco police wrongly arrested a Deputy Public Defender last year and unnecessarily detained her in handcuffs for an hour, the city’s Office of Citizen Complaints has found. San Francisco Public Defender Jeff Adachi released the OCC’s Dec. 9, 2015 preliminary findings today after receiving them from the complainant, Jami Tillotson. 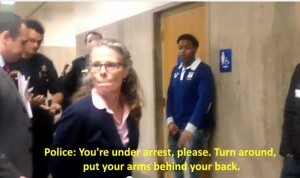 The former San Francisco Deputy Public Defender made the complaint shortly after her Jan. 27, 2015 arrest outside a Hall of Justice courtroom. Tillotson was arrested for allegedly obstructing police after she questioned why officers were photographing her client and another man outside a courtroom. She was led to the police station and handcuffed to a bench for an hour before being released. The district attorney declined to file charges. The incident, which was caught on video and viewed by 1.5 million people, sparked national outrage, particularly among public defenders. The OCC sustained two of Tillotson’s complaints against the officers: Making an arrest without cause and detaining a person in an unduly prolonged manner without justification. Sustaining a complaint means a preponderance of the evidence proved improper conduct. OCC investigators found a policy failure on the part of SFPD on two allegations, including the interfering with the right to counsel and conduct reflecting discredit on the department in the case of an officer who made inappropriate comments to the media following the incident. The SFPD watchdog organization found training failure was at the root of a neglect of duty allegation against an officer who interfered with the rights of onlookers videotaping the encounter. Several other allegations relating to the incident were either not sustained, found to be proper conduct, or there was no finding. It is unknown whether the officers were disciplined in the matter. Tillotson said she was frustrated by the lack of information provided by the OCC and the police department. Tillotson’s arrest was just one in a string of national incidents where public defenders faced disrespect and in some incidents, violence. Last June, a Florida judge challenged and engaged in a physical fight with a veteran public defender after the public defender refused to waive his client’s right to a speedy trial. Also last year, a Mississippi judge permanently banned a public defender from his courtroom for her zealous representation and announced he would reassign all of her cases to private attorneys against the clients’ wishes and in violation of their 6th Amendment right to counsel. This week, a district attorney investigator in Orange County beat a defense attorney bloody after the defense attorney scored a court victory against the district attorney’s office in the ongoing jailhouse snitch scandal.